Rain or Shine! This coming Saturday, October 3rd, from 10 a.m. to 2 p.m., the Studio is having it's first Quilters Garage Sale in conjunction with it's Quarterly Open House. If you have quilting fabrics, supplies, kits, books, patterns, etc. that you would like to sell, then this is your last week to reserve a Studio table for the garage sale. The Studio has garage sale ads in the Seattle Times, Craigslist, Issaquah Press, and Sammamish Review all this week, so we're looking forward to a good turn-out. There are only a few tables left so email me right away to reserve one. You'll need to arrive at the Studio at 9 a.m. to give you time to set up, and you should be able to take down your table between 2-2:30 p.m. I'm excited and am really looking forward to seeing each of the tables see a good day of sales. The Studio will also be having it's Fall Open House, so if you are not interested in a table for your own quilting world, please come by to pick up a Fall Class Schedule and see what we have. 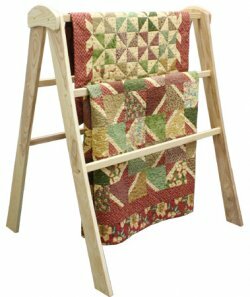 The Studio will also be having a "garage sale" with fabrics, kits, books, patterns, supplies, and even quilt racks (pictured).